The Ultra Crete Asphalt Repair Kit is the choice of professionals all over the country, from private contractors to large industries, councils and local authorities. Efficient, safe and reliable, the kit contains everything required for a lasting repair and comes with the usual Twistfix guarantees of effec­tiveness. Potholes are unavoidable; the surface fatigue experienced during general usage causes vibrations which lead to tiny hairline fractures. The edges of these begin to work loose and water gets inside which, when it freezes, expands and widens the crack. This lets more water in and the freeze-thaw cycle is set in motion, progressively widening the cracks until the surface material begins to come apart. Potholes can be dangerous to pedestrians who can easily trip on the unlevel surface, particularly if the light is low. They are also an impediment to driving. Damage to cars is often experienced as loose stones from the pothole are dislodged, an issue that also makes the pothole even larger. Repairing them immediately they are noticed is clearly essential and there is no better way to do it than with Ultra Crete. The kit contains a cold-lay asphalt and delivers swift, lasting repair to a number of surfaces, including driveways, courtyards, roads, car parks, footpaths, patios and sports courts. It can be used in any weather condition with equal effectiveness and the permanent repair helps to prevent damage occurring again. 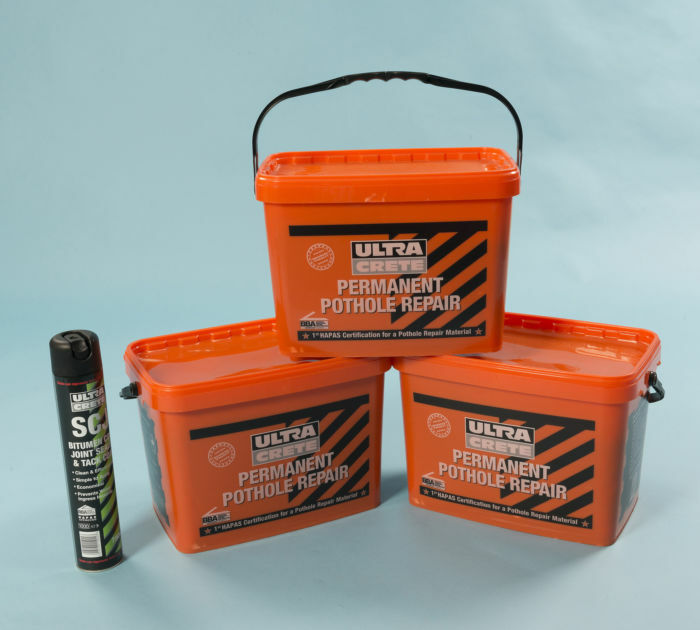 You can now save a cool £45 when you buy the Ultra Crete Asphalt Repair Kit from Twistfix. For just £141.48 fully inclusive of VAT, you receive three 25kg tubs (resealable and recyclable) of cold lay asphalt plus 750ml of bitumen cold joint sealer to guard against the dreaded freeze-thaw cycle. This is a limited-time offer so stock up now and start filling in those potholes!